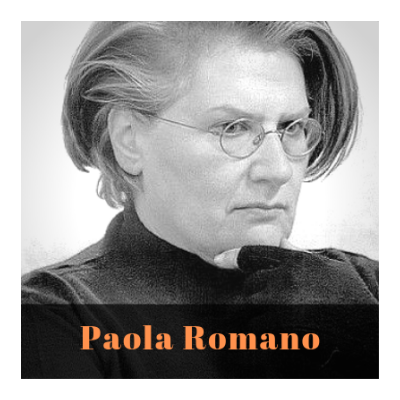 Paola Romano was born in Monterotondo (Rome) in 1951. She studied at the RUFA (Rome University of Fine Arts), and developed her style in the Roman artistic environment; later, she opened an art studio in the suggestive ancient borough of Rome, where she currently works and dwells. Her first solo show of 2005, at the Galleria dei Leoni in Via Margutta, was followed by many important exhibitions both in Italy and abroad. Indeed, since 2000 she undertakes an active pathway in the creation of artworks with different kinds of materials. Matter, with all its possibilities of manipulation and its enthralling forms, becomes the main protagonist of her following series. Among her most important series, we find “Moons” (“Lune”), which in 2012 dominated the sky in via Margutta in Rome, the series “Planimetries” (“Planimetrie”), “Plastics” (“Plastiche”), “Zoom” (“Zoom”), the evocative series of works realized in fresco, the very celebrated bronze sculptures, and the series “Monochromes” (“Monocromi”). The aesthetic impact of Paola Romano’s artworks is strong and fascinating, and it has been noticed by some important Italian film directors and scenographers: in 2005, Pupi Avati commissioned to the artist three artworks for his film “La cena per farli conoscere”, and in 2014 one artwork from the series “Monochromes” appeared in the film “Sotto una buona stella” by Carlo Verdone. In 2012, one of her “Moons” appeared in a scenography of the theatrical play “Penso che un giorno così…” by Gianni Nazzaro. The series found a great success and fascinated also the “Gruppo Zarineh Tappeti”, which decided to produce precious fabrics inspired by a selection of the artist’s artworks, presented for the first time to the public at the exhibition “Farshe-Mah” (“Moon Carpets”) in 2015 at the Convention Center of Rome Events. Notewothy among her main expositions are: the exhibition at the “Cultural Center” in Hong Kong, the exhibition at the Università Pontificia Urbaniana in Vatican City, the solo shows AD-“Visioni”, “Dal Cosmo al Caos” and “Esperienze Estetiche”, and the group show “La Natività” in Rome (between 2005 and 2007), the itinerant exhibition “Quarta Fase”. “Emozioni plastiche” and “Le Forme dell’arcaismo” (2008), the group show “Domina” in Catania, the solo show “Plenilunio Fantastico” and “Nove Lune Novilunio” between 2009 and 2010. In 2011, she takes part in the 54th Venice Biennial in the Italian Pavilion at the Venice Armory, where she exhibits an important three-dimensional installation. In the same year, she takes part in the show “Il Mare della tranquillità” at the Museum of Sea in Genoa and in the exhibition at the Lab for Art in Milan. In 2012, she realized the exhibition “Equilibri astrali” at the complex Sant’Andrea al Quirinale in Rome and the personal show “Paola Romano tra sogno e realtà” at Nova Milanese. The following year, she exhibits at the new location of the Philobiblon Gallery in Rome with the solo show “Io, Paola Romano”. In 2014, she had the double personal exhibition “Similitudine e Contrasto” at the complex of the Vittoriano in Rome and “Sconfinamenti” at the Academy of Romania in Rome. Among her latest expositions, worthy of mention are “Silenti Riflessi” at the Stadio of Domiziano in Rome, the exhibition at the MACRO in Rome and in Broadway, New York, in 2018. It is also possible to admire Romano’s artworks in permanent exhibitions at the Fondazione Magna Carta in Rome and at the Sale Urbaniane in Vatican City. Among her recognitions, worthy of mention are the “Premio Internazionale Arcaista” of 2007, “Approdi d’Autore” and the “Premio Roma” of 2009.